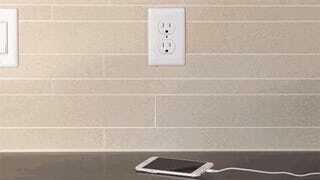 The days of having to wire up a complete replacement outlet to add a USB charging port will soon be long gone. The same folks behind the SnapRays Guidelight, a replacement cover that added night lights to almost any outlet in your home without wiring, is back with an even better product. Their new SnapPower Charger cover can be installed on any outlet, but instead of lights it adds a USB port for charging your electronics. The SnapPower Charger is simply a replacement cover plate featuring a pair of metal prongs that reach around an existing outlet and make contact with the screws holding its electrical wiring in place. Once the cover plate is snapped on and screwed into place so it's secure, the USB port instantly has power. It's a brilliantly simple solution to the annoying problem of having to hunt down a power adapter when you want to just charge a gadget. And while the creators of the SnapPower Charger could easily charge a premium for their new product (and still sell millions) they're instead going the Kickstarter route and asking just $16 (or $12 for early birds) to pre-order one. They're even cheaper if you buy them in multi-packs, and are available in three different colors and two different styles. If you've never donated to a Kickstarter project before, this will probably be your first.